You can PLEDGE ONLINE as generously as you are able! The Canvass, held every year in February and March, is the most important fundraising event of the year at UUCR! The results of the canvass are the primary basis for annual financial planning and related decision making by our Board of Trustees. What Does “Legacies of Love” mean? My goal [for this year’s theme] has been to convey both the deep roots and high aspirations embodied in the investments and contributions made by our congregation, as well as our interconnectedness with the natural world – and, by extension, with each other. Love is a legacy that takes root and moves through the years, changing us as a congregation and transforming us as people of a shared faith. Love travels from heart to heart, from adult to child, from newcomer to long-timer. Love travels from person to person…and as it travels it grows deeper and stronger. When all is said and done, love remains. We are the beneficiaries of many decades of Legacies of Love. Now, it’s our turn! What legacies will we leave? What future will we unfold through our generosity? Our canvass pledge goal for our next fiscal year (July 2019 thru June 2020) is $ 672,562. 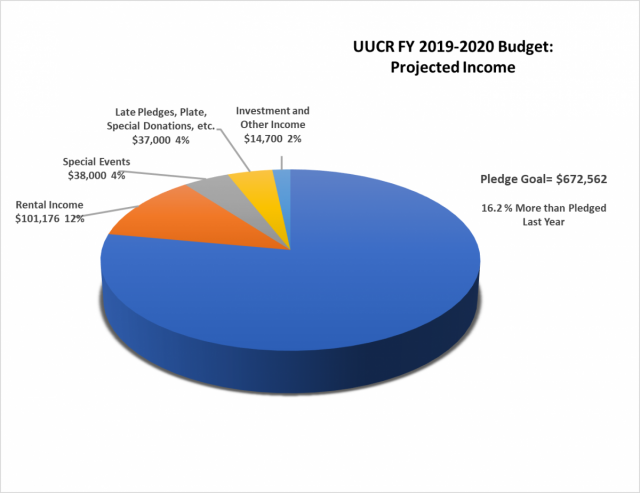 This pledge goal is about 80% of all of UUCR’s projected income--- to support all the very meaningful things that UUCR does and will accomplish in FY 2019-2020. Why is our pledge goal so high this year? Our pledge goal increases pledged funds by 16.2% over last year’s pledges. This increase supports a 5.3% overall increase in the operating budget, while covering anticipated declines in other income streams, such as Other Rentals and the Fall Fundraiser. Our pledge goal is higher than usual this year because we aspire to have a balanced budget which does not require a draw-down from our asset base (funds which are set aside for special purposes and to provide for UUCR’s long-term financial stability.) In FY17-18 a draw-down of $26,000 was required to balance the budget. It is projected that, for the current fiscal year, a $29,000 draw-down of assets may be necessary. And we will do all those other things that make UUCR the wonderful place it is for you and our community! 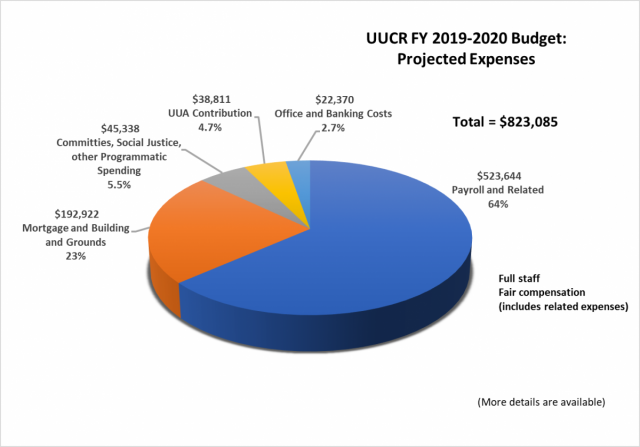 What are the 2019 – 2020 projected “costs and obligations” at UUCR? The following chart summarizes the costs which the UUCR Board of Trustees is currently projecting for the next fiscal year. What are the sources of income for UUCR? Don’t we have more income than just pledges? Yes, we do. For example, we currently have rental income (from two nursery schools that use buildings 2 and 3 each weekday) and the income raised from special events like the Action Auction each spring. There are a few additional sources of income. How can I participate financially in Our Legacy? Your pledge, like any commitment, is a personal expression of your values and what UUCR means to you, as well as your other financial obligations and choices. Last year the average UUCR annual pledge was $2,625 and the median pledge was $1,700. If we are to meet our goal, much more will be needed. Please consider thoughtfully: How can I participate in our Legacy of Love? and make the most generous pledge possible. As a very general guide, we can provide this guidance. Do you see yourself in one of these? Note that within each commitment level, the guide is progressive, with giving levels rising with capacity. This year, “Pledge Sunday” will be held on March 3! At the end of this very special worship service, all members and friends who attend will be invited to complete an annual pledge card. If you are unable to attend on March 3, you can pledge through a canvass team member, and you will be able to pledge on-line. Throughout the remainder of March, there will opportunities to learn more about the 2019 Canvass by visiting the canvass table in the entrance corridor on Sundays. Please stop by the table to complete a pledge card if you haven’t already done so. How and When Do I Pay My Pledge? Pledges made during this canvass should be fulfilled by a single payment or multiple payments (monthly or quarterly, for example) before June 30, 2020. Checks can be mailed to UUCR (100 Welsh Park Drive, Rockville, MD 20850), placed in the offering basket during Sunday morning services, or placed in the deposit slot in the wall of the Building 1 hallway (across from the copier workroom/quiet sitting area). Whichever method you choose, please put “pledge” in the memo line of your check to ensure it is properly credited against your pledge. Pledges can also be paid through direct debit. To make a one-time payment or to set up a regular monthly payment from your checking or savings account, simply click here. To learn more or to request assistance in setting up your direct debit, please contact UUCR Assistant Treasurer, Eric Burch. Later this spring, pledgers will receive quarterly statements from the UUCR Assistant Treasurer that show your commitment for UUCR's next fiscal year. If you have any questions or suggestions, please send them via email to canvassteam@uucr.org.